Tam Coc, a little paradise only a 2hours ride South of busy Hanoi. It is the perfect spot to get out of the city, and enjoy some time in the nature. With its natural surroundings of lime stones, and rice fields, Tam Coc is called the "Ha Long Bay on rice paddies", "inland Ha Long Bay" or even "The dry version of Ha Long Bay". 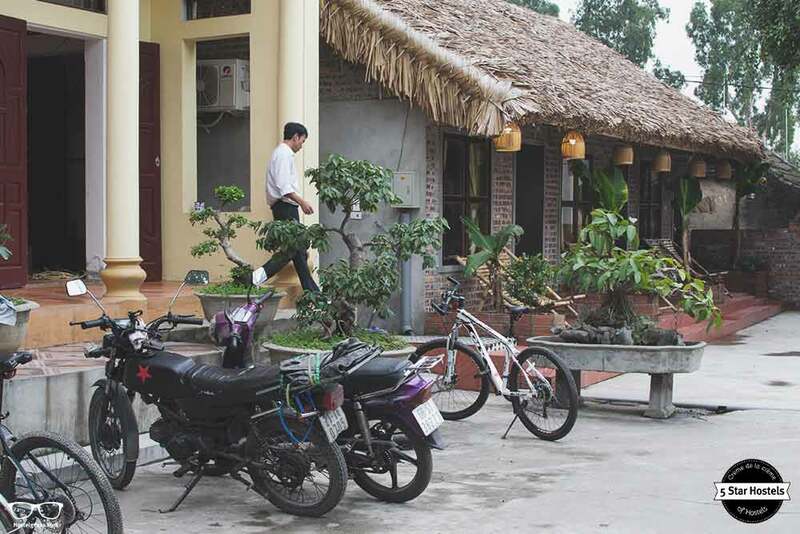 Since 2016, Tam Coc has its own little quality hostel, inviting you to spend some quality time. 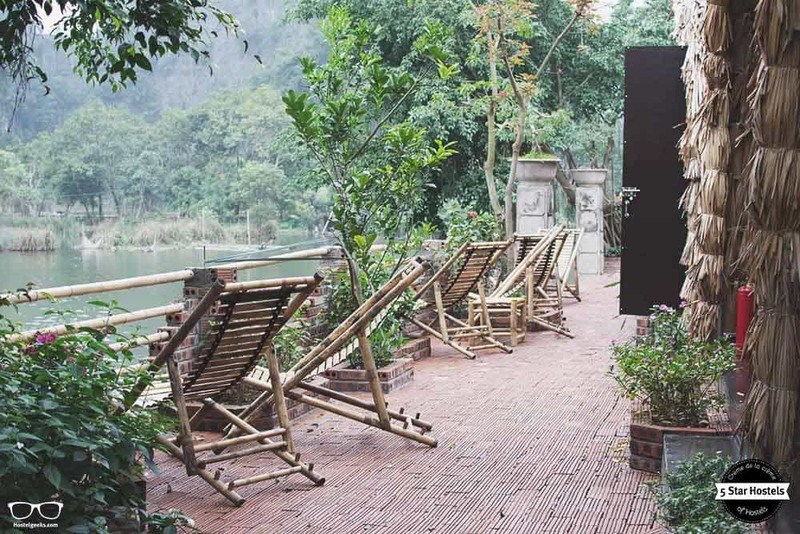 Away from the tourist path, and located directly at the riverbanks, Tam Coc Bungalow is a remarkable place. We have visited the Bungalow and found tranquil, social vibes, Vietnamese charm, and delicious banana pancakes with breathtaking morning views. How to book Tam Coc Bungalow? 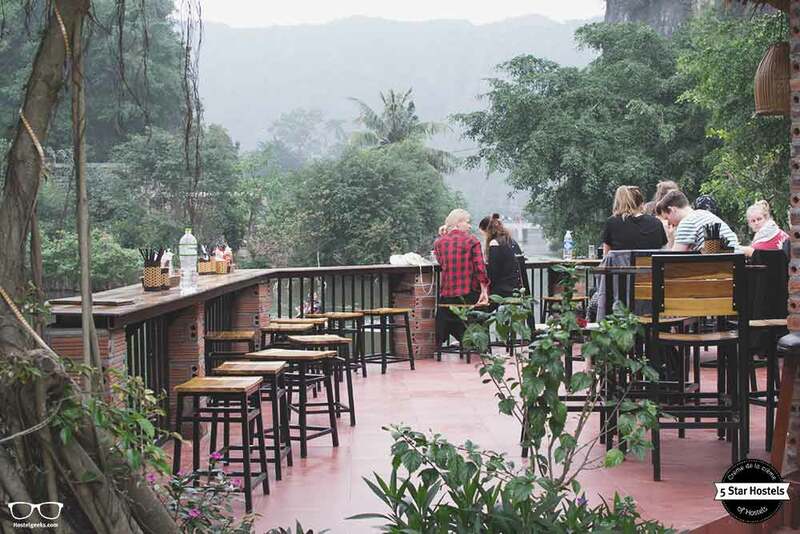 You just found our #1 recommendation for best hostels in Tam Coc, Vietnam. Genuinely, Tam Coc Bungalow is the accommodation we recommend to our friends, family, and to you! You will like it! 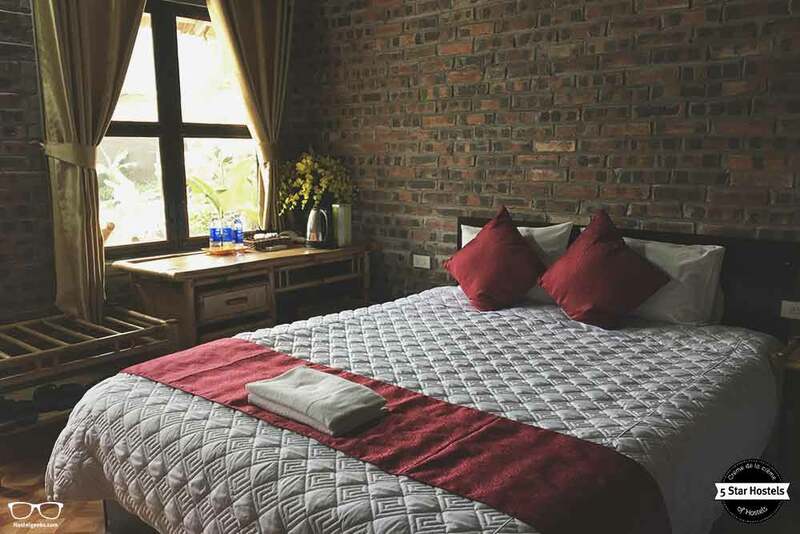 Planning to stay at Tam Coc Bungalow? Please use the links provided above. It's inside Tam Coc, but seriously hidden. It helps to have a motor bike to come here. There are signs to get here, starting right from the main square. Walking here takes you around 15 minutes, by motor bike it is only 5 minutes. 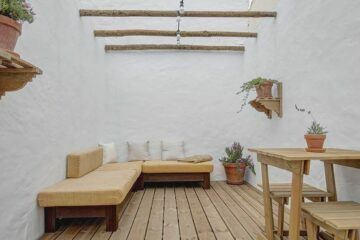 The location is fantastic as you it's only you and all guests, tucked away from the busy tourist street. You can sit right at the water, watching the boats passing by. We are Hostelgeeks, your independent gateway to the best hostels in the world and Vietnam, the 5 Star Hostels. Vietnam is an extremely interesting country, becoming more and more popular for budget travelers in style. This is why hostel-type accommodation is on the rise here. 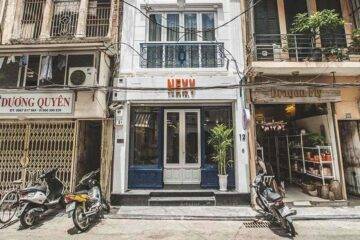 Find here our the complete guide to best hostels in Vietnam. 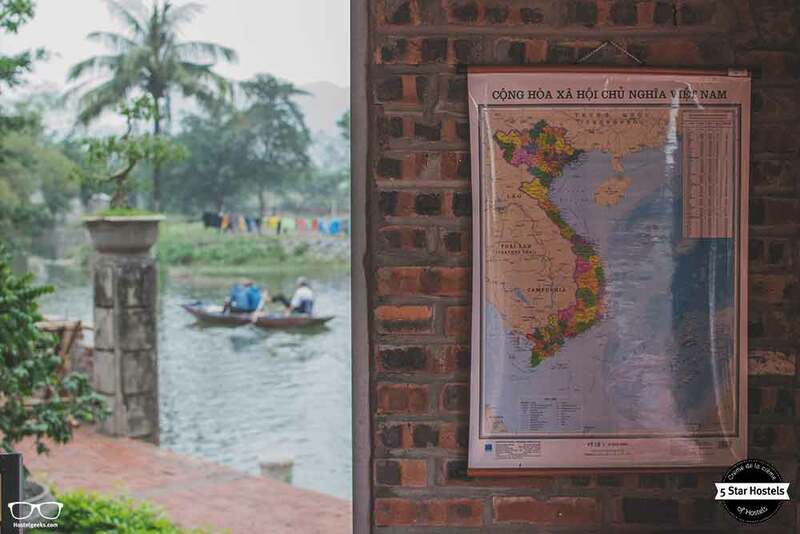 We also put all hostels on a map and the perfect backpacking itinerary for Vietnam. 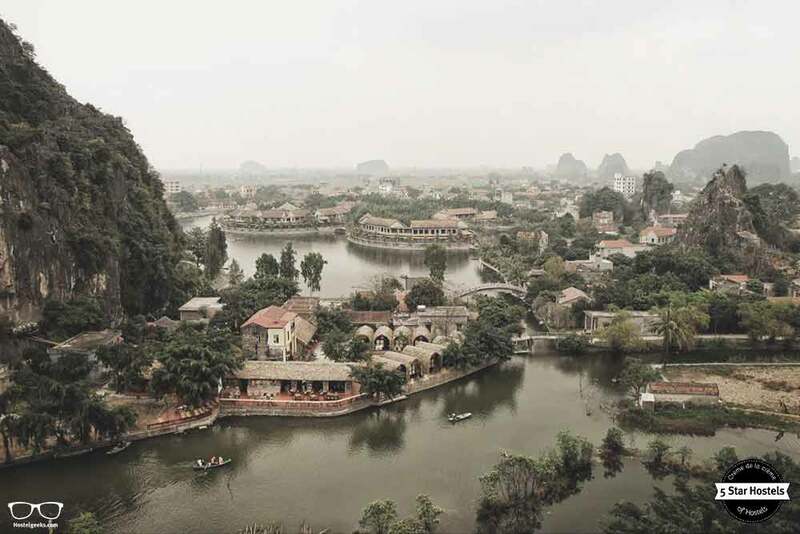 Tam Coc is located only a few km away from Ninh Binh, the bigger city next door. 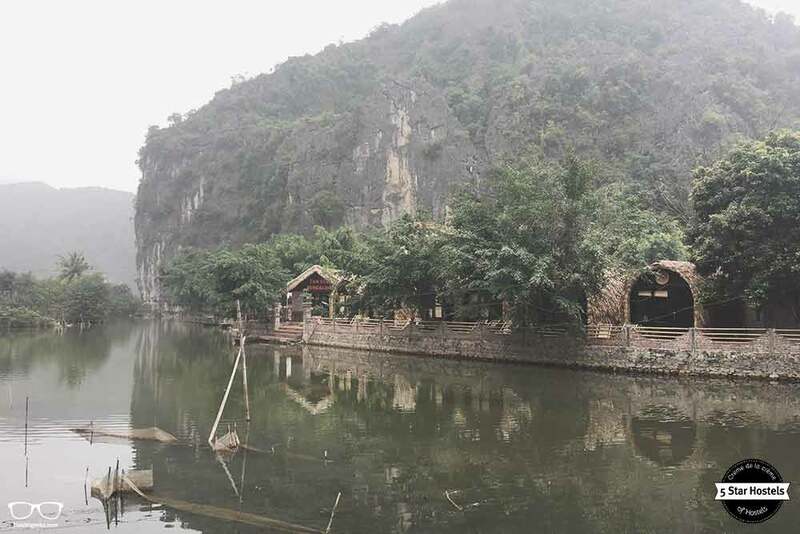 We highly recommend staying in Tam Coc for your time here as it gives you instant access the beautiful surroundings. After all, Tam Coc is the little brother of Ha Long Bay, no doubt it. And yet, it is unique. Numerous of Pagodas are there to visit, and the river is clearly the busiest street in the area. So, ready to have a look inside? Let’s park the motorbike (for free), and walk in. The hostel is build with local materials, using bamboo and concrete as materials. 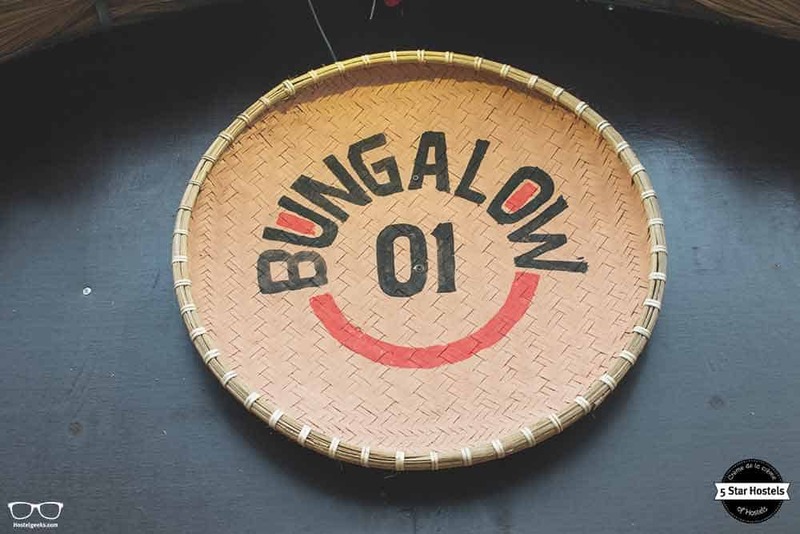 As far as sustainability goes, the Bungalow supports local tour providers, and encourages travelers to explore the area by renting a bike and skipping the motorbike. This is the best way to get around. 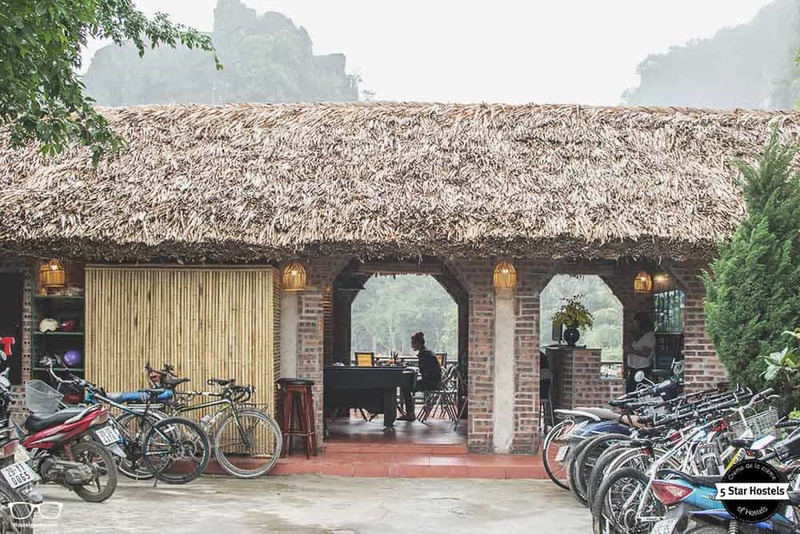 You can cycle to the inspiring Thai Vi Temple Đền Thái Vi and to Mua Caves, and get around the valley. In front of the bungalows with the sea view you find bamboo hammocks. A perfect spot to have a smoothie and watch the stunning nature surrounding the hostel. Yet of course, Tam Coc is locally managed and even designed by the owner Tuan. 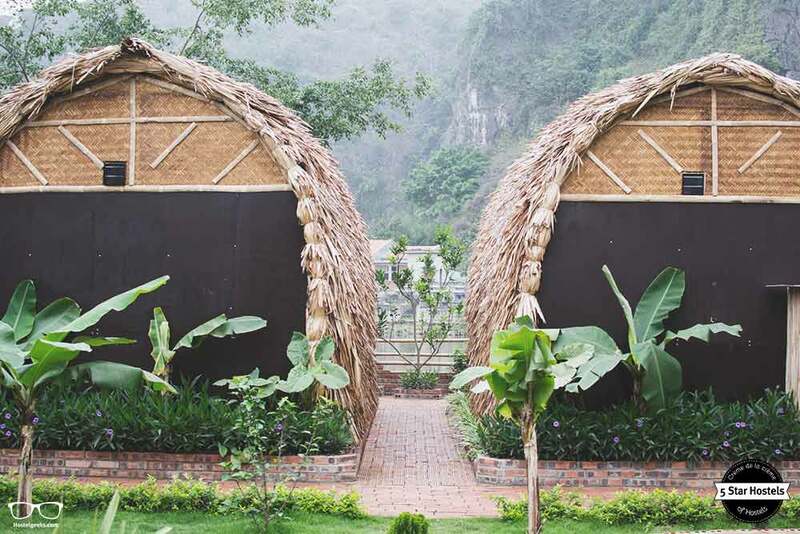 Bungalows seem to the best latest trend in Vietnam. We came across the Bungalow style the first on our visit to Cat Ba (here is our Cat Ba and Ha Long Bay photo story). The bungalows allow guests to have their own little apartments in a Vietnamese-Style. This is how we felt like. The Tam Coc Bungalow offers 3 types. The Family rooms on the right hand of the entrance, and the double and twin rooms with garden view or even lake view. The dorms with shared facilities can be found right-hand behind the reception, passing the terrace. The decoration is really detailed, including a natural environment and materials. 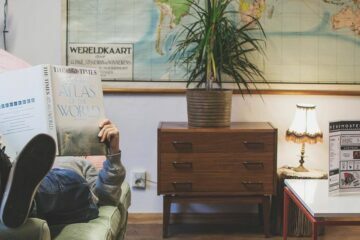 Here is an overview of all the different room types at hostels. 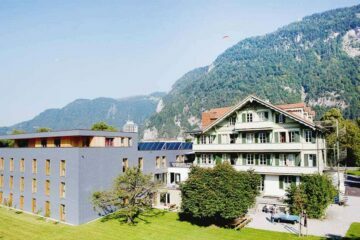 For us, it is the views and location letting this hostel stand out from the rest of accommodations in the area! Tucked away from the tourists flooding the entrance of the city (this is where all the boat tours start), Tam Coc Bungalow is located away from the regular tourist path. It is best to reach via motorbike, bicycle and even walking is possible as it takes you around the small village for 10-15 min. It is a perfect base to explore the area, and to unwind after a long, tiring day. For some inspiration, here is a list with awesome photos on things to do in Tam Coc. Have a look at the photo below. This is indeed the location. And yet, it’s even more pretty in real-life. For whom is this hostel? looking for a tranquil, yet social experience in a quiet area. 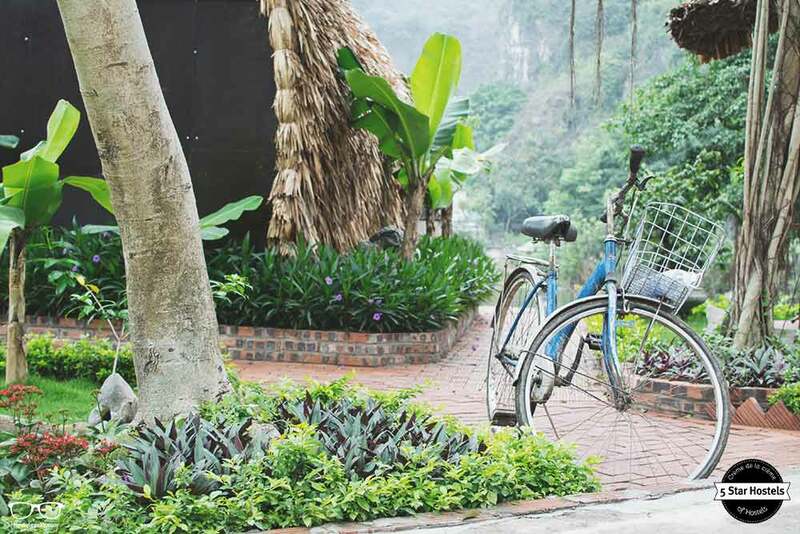 As it is tucked away from the tourist spot of Tam Coc, it’s perfect for everyone preferring a quiet night. It is not really recommended to the young backpacker looking for a super-cheap place to stay and mingle with fellow young budget travelers. After a long day exploring Ngo Dong River, Mua Caves, and Bai Dinh Pagoda (the biggest Pagoda in Vietnam), it is time to kick-back and have a drink on the terrace. This is exactly what you can do at Tam Coc Bungalow. As you are away from the tourist path, it is a great place to order some food and a drink, and to chill on the terrace. The bar offers different beverages from local to international beer and wine. You can even spoil yourself with delicious fruity cocktails. The pool table in the middle of the common area is a popular to spend some time. With a lovely detail to mention. 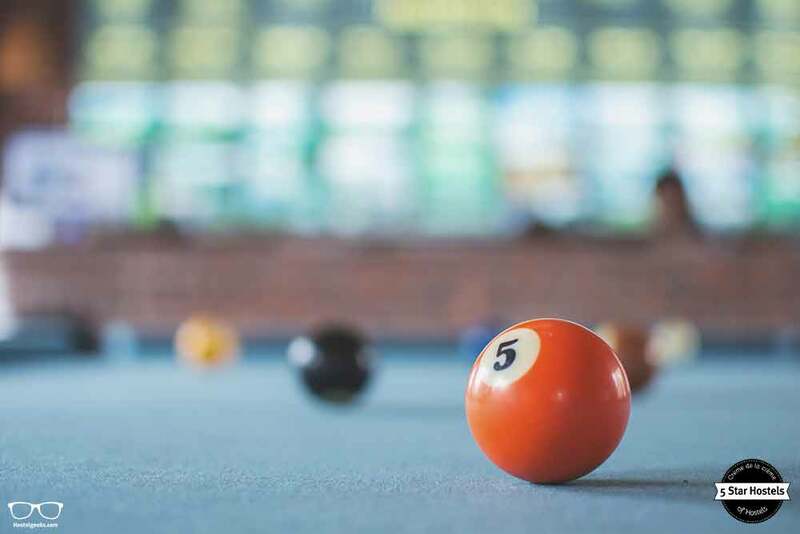 The white billiard ball is not to find, so therefore you’ve to take the #1 yellow billiard ball as the main one. The big screen on the terrace is used for special occasions and big groups to watch movies. Can you imagine sitting here at night, the river on your left and your cold drink in the hand watching Game of Thrones? 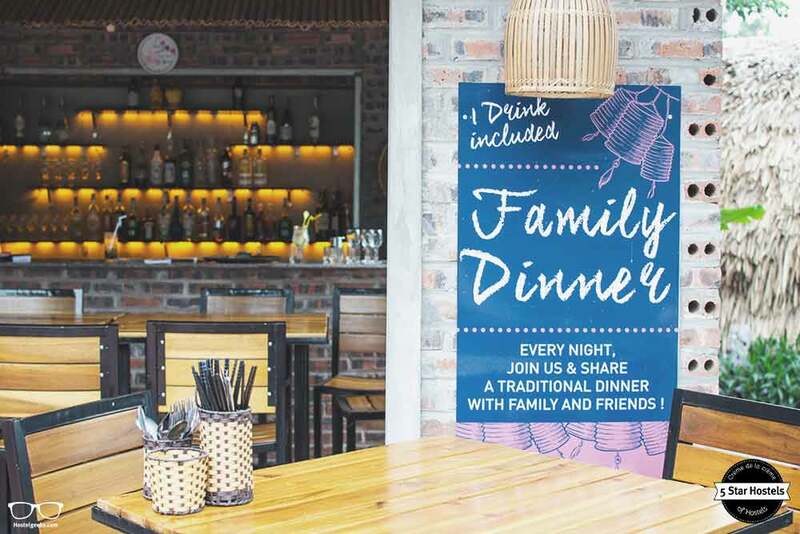 As for events, there is the daily family dinner to join. Highly recommended! 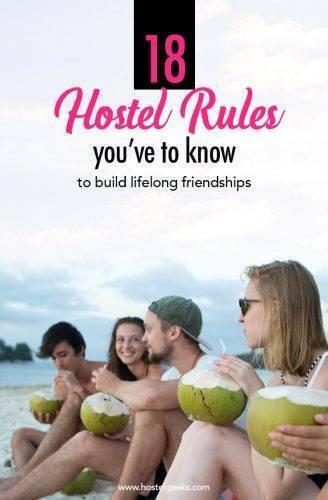 On that note, here is a list of 46 things that make a great hostel. Last but not least, the working people here. Every worker here is a local with expertise knowledge on the area. When we visited the hostel was open for only 3 month, and you can already how they are adapting and improving their services due to the needs and requests of the guests. The staff speaks English, although not perfectly it is easy to get your info on what to do in the area and things you need. The team is happy to help you out with booking your bus to your next stop like Hué, Phong Na in the south or Hanoi and Ha Long Bay in the North. 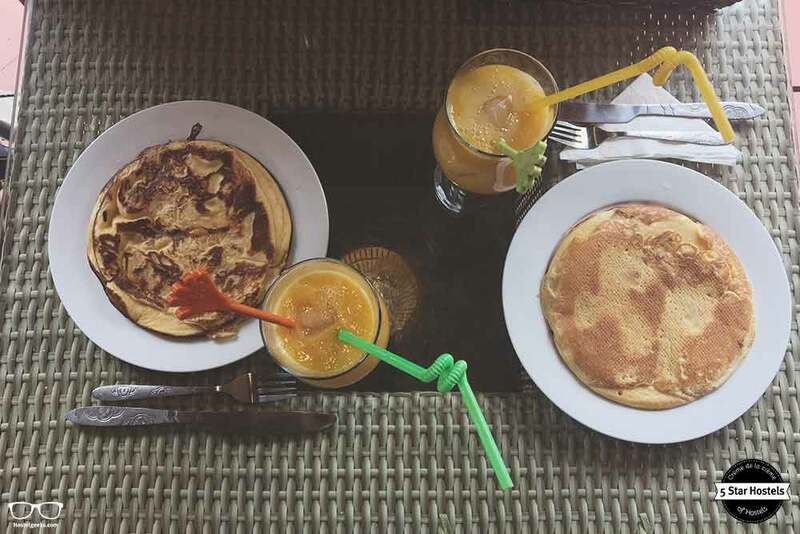 The breakfast is included and you can choose from different fruit smoothies and delicious, fluffy pancakes with bananas and even pineapples. We recommend getting the pineapple option – very fruity! We spent quite some time here in the Vietnamese capital. You can find many cool things from Museums, bars, rail roads, nightlife to day trips. We traveled Vietnam for 3 full months. 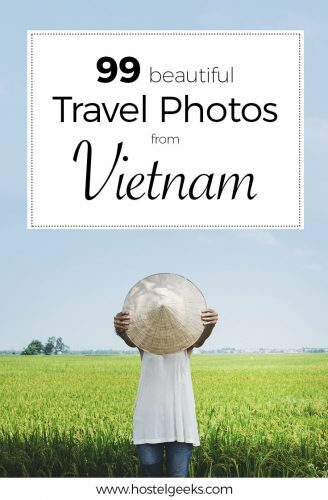 We have been off the beaten path as well as to all the places to visit in Vietnam. Here you can find our Ha Long Photo Story. Here you find 99 photos from Vietnam. Bonus: 27 Things to do in Vietnam. Any questions on traveling Vietnam? Drop us an email. Fancy a promo code for Tam Coc Bungalow? Who doesn't?! Now, there is no easy way to say this: Currently we do not have a valid discount for Tam Coc Bungalow. We are working on getting more promotional codes for Tam Coc Bungalow in Tam Coc, Vietnam and all the other top hostels we reviewed for you. 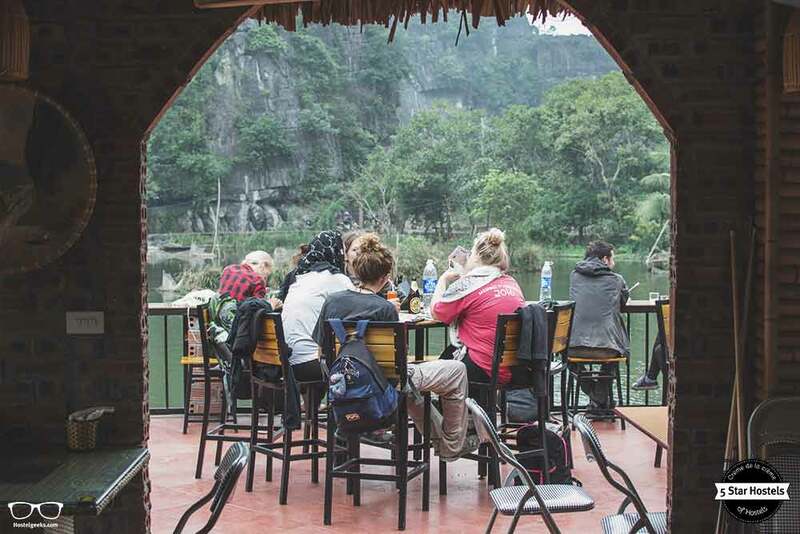 You were looking for the absolute BEST hostels in Tam Coc, Vietnam? You just found it! Tam Coc Bungalow is the top place we recommend to our friends, family and to you! 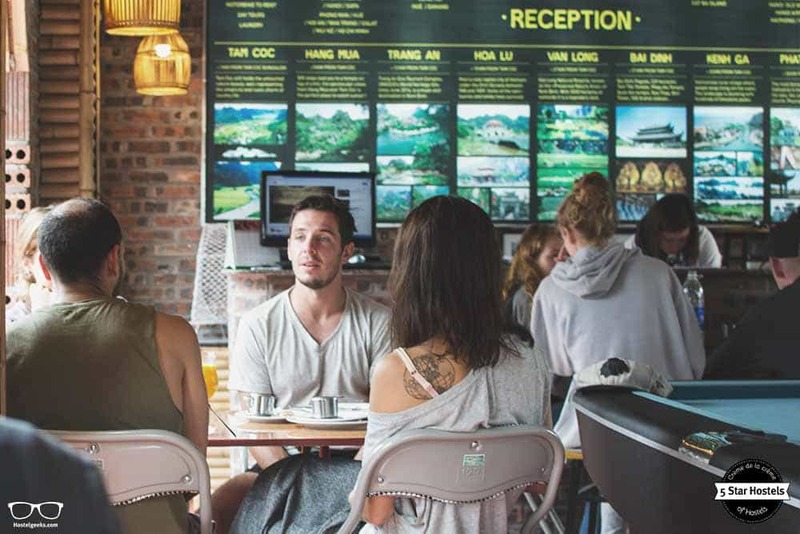 Update April, 2019: How to find flight deals to Tam Coc, Vietnam? Still looking for cheap flights to Tam Coc, Vietnam? We LOVE Kiwi.com. You can search here with a so-called "radius search". It is incredible easy to find sweet flight deals to Tam Coc, Vietnam and area.